Mindfulness also involves acceptance, meaning that we pay attention to our thoughts and feelings without judging them—without believing, for instance, that there’s a “right” or “wrong” way to think or feel in a given moment. When we practice mindfulness, our thoughts tune into what we’re sensing in the present moment instead of rehashing the past or imagining the future. Mindfulness is the foundation of a reasonably happy, successful life. It allows us to gain awareness of our feelings, thoughts, behaviors, relationships, and environments. Awareness then helps us to make more informed and effective choices and build a more satisfying life. Neuroscience research shows that mindfulness makes positive and lasting changes to our brains. Mindfulness also teaches us to predict what will happen next – in ourselves and the world outside. A couple of months after practicing mindfulness, I learned that if my nose starts to burn, I am going to start to cry. I have plenty of time to change my focus to stop the embarrassing tears. That, for me, is more that a small step toward self-control because I’m a crier. By observation, I have realized that little more than amusing lie from someone most often predicts greater deception down the line. I not only have more control over myself, but I am prepared for those things that happen outside of my control. Mindfulness skills open doors to acceptance, experiences, and allows us to see where we connect with the rest of the world. The knowledge adds up and allows for more complete and richer information and experiences to guide us. It helps us avoid our default ways of being, like disconnected, judgmental, and alone. These default approaches reduce our experience because we label and categorize and quickly move on without viewing either the bigger picture or the underlying meanings thereof. When we are engaged in mindfulness, we practice a kind of separation from our thoughts and emotions because they are either from the past or plans for the future. Only those that apply to the here and now are given any attention. It isn’t clearing of the mind as westerners often suspect. It is a matter of allowing the thought to come along, acknowledging it as if it were a person you were casually meeting on the road, and letting it pass by without creating a big upset. In some theories, it is called “Dispersion”. It could be a sad thought or an angry thought. As you come into contact with painful emotions you make room for them, acknowledging them as I said above and letting them go. That is not to say that you will not feel the pain, it just won’t have the power and influence over you that it once did. Marsha Linehan, Ph.D. and Steven Hayes, Ph.D. call this activity, acceptance. I think of it as passing by a person that you don’t particularly like and having a polite conversation until that person continues on their way. You can learn to accept the thoughts and feelings, but you don’t have to like them or approve of them. Marsha Linehan of the University of Washington refers to a kind of acceptance that she calls Radical Acceptance for situations that are catastrophic like the loss of a loved one or a disability. No matter how terrible the situation is, you can learn to accept that there is nothing that can be done to change it, so you must either accept it or continue to suffer because of it. A third activity involved in mindfulness is to be present in the moment. Put your attention firmly on what is happening right at this moment and allow thoughts of the past and worries of the future to just make themselves known and drift away as you return your focus to the present. You observe almost like an outsider to the conversations and the other things that are going on and participate with your full attention. Observe without making a judgment about a thing being good or bad – only that it is. Soon you will be able to see what is important to you and what is not. A committed and meaningful life begins with taking action when it comes to things that are important to you – the things that you want your life to stand for. As one of the most worthwhile pursuits in Ritual Humanism,® our efforts dedicated to mindfulness will reap great benefits if practiced daily. I will give specific exercises that will teach the other skills needed to nurture mindfulness. For one thing, mindfulness over time develops what we call psychological flexibility. This is a state where you are able to adapt quickly and easily to situations with awareness, openness, and to take effective action based on your values. Reading what is written here will not get you out of your head and into your life. You must practice what is here and be prepared to complete the exercises. Otherwise, it is like watching a special on the Winchester Mansion in San Jose but never having seen it in person. It just doesn’t have to same effect. The concept is straightforward, but being mindful requires both attention and disciplined practice over time. This is largely the importance of ritual in Ritual Humanism® since performing to rituals properly requires mindfulness. Are you still having difficulty grasping the idea of mindfulness? It means paying attention, examining each detail and wondering what it means, if anything. The best description I ever heard was from a Buddhist master Jack Kornfield. "Imagine something has awakened you in the middle of the night. You seem to recall a loud noise but you can’t quite remember what it was. You lie there quietly, listen to every little sound, and watch for every movement analyzing it all. Is someone in the house? Am I in danger? You might even sniff the air to see if you smell smoke. Is there a car in the driveway? Is that dog next door barking? Why would he bark at this hour? Has someone just delivered the morning paper?" "You focus your attention completely on every activity within your environment. You observe and analyze everything that happens until you’re convinced that you know the right thing to do. You may decide you are safe and just go back to sleep, but you may decide it is best to dial 911 because unfamiliar sounds and sights continue to break your calm. Either way, you have applied your whole mind to the problem." That’s what mindfulness is. What if you were able to focus your attention to that degree all the time? What problems could you handle better or even avoid altogether? For our exercise, this time, we are going to do something very simple to help you focus on one thing. You will need a box of crayons; colored pencils; pens, or paints; and a Mandala. Mandala (Sanskrit: मण्डल Maṇḍala, 'circle') is a spiritual and ritual symbol in Hinduism and Buddhism, representing the Universe. 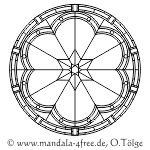 In various spiritual traditions, mandalas may be employed for focusing the attention of practitioners and adepts, as a spiritual guidance tool, for establishing a sacred space, and as an aid to meditation and trance induction. 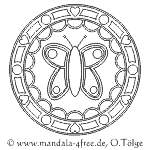 There are numerous websites where you can obtain free Mandalas. However, for many, free is conditioned on you giving them your email address, or you downloading some software that you don't want. This is a great site. It is easy to use (although you may have to click the "english" button if it comes up in "german"). It opens up displaying a selection of popular Mandalas. There are over 300 Mandala to choose from. You can select them by number, complexity or "heaviness," and by various categories. Under each Mandela are two buttons, one to preview or "Vorschau," and one to display a PDF version for you to print. 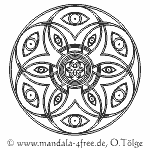 The Mandalas are free for individual use. We checked with him for permission to display several here. In addition, it is OK for you to download one, (or more) color it, scan it, email it to us, and for us to display your artwork on our site. Or for that matter, for you to display it on your Facebook page. We obtained clarification on the prohibitions on derivative works and on sharing. 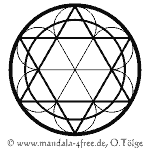 The "work" referred to in the copyright notice is Oliver's blank Mandalas. Once you color it, it becomes a joint work on which you can add your name and show it to your friends. The key is to not remove his copyright notice from the bottom of the Mandala. No sharing: You may not distribute the work. No Derivative Works: You may not alter, transform, or build upon this work. This work is just to print off and colour in. Social Services: Kindergartens, schools, and social services providers may use the templates for their work. In Ritual Humanism,® we use Mandalas as a tool to help you focus your attention as you practice Mindfulness. So choose one and print it out. Then just sit down and color your page. If your mind starts to wander just gently bring it back to the color, the texture, and the overall effect. It might be wise to choose a length of time, say 10 – 15 minutes, and stop at that point. First, you may find it difficult to pay attention to only one thing for 10 whole minutes. Second, you may get caught up and do nothing else all day if you don’t set a limit. So there you have it – your opportunity to try mindfulness. What did you notice about coloring the picture? In what order did you decide to color it? Write about what happened, what you noticed, or what you learned about yourself. Did you notice thoughts and feelings coming to mind? Were you able to embrace them and let them pass? We are thinking of having Mmandala contests. The idea is to encourage involvement by our readers. 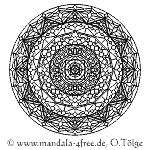 We would display the winning Mandala(s) on our home page. Additionally, we have thought about offering free memberships or membership extensions as prizes. What do you think? Sent us your thoughts using the Comments Form below. We continue our discussion of Mindfulness on our next page Beyond Simple Mindfulness.